Rotherham boss Paul Warne says he will not make more than one loan signing this month, but could bring in two permanent additions. 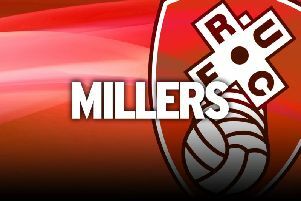 Warne is desperate to add to his squad during the January transfer window as he tries to give the Millers a boost in their Championship relegation battle. With Ryan Manning being recalled to QPR at the start of the month that has opened up one spot, with each club being allowed to name five loan players in a matchday squad. In theory, Warne could have as many loanees as he likes in his squad, but does not want to alienate players by leaving them out of the group on matchdays. Warne would much rather bring in permanent transfers and admits two could come through the door, depending on potential departures. “I could potentially bring in as many loans as I like,” he said. “Personally I don't like having more than five loans, having more than that brings disharmony. “You have a player who trains all week and then you say, 'Oh sorry you're not coming to Ipswich'. “It's not good. “I will only bring in one loan, I could potentially bring in a permanent. “Depending on what happens at the other end, I might bring in two permanents and one loan. Warne is hopeful of making his first addition before the vital trip to Ipswich at the weekend, where defeat to the bottom club would be a hammer blow to their survival hopes. The Millers boss has met with two targets in the past few days and reported back that the first one expressed his desire to join. Meanwhile, Pep Guardiola said he had to name a strong line-up against the Millers in the FA Cup at the weekend. City made eight changes to their side for their third-round tie from the one that beat Liverpool three days earlier and the Spaniard said it was important to win. He said: “We took it seriously, we did what we had to do to become a great, great club. “You have to do your job and we did it amazingly again. We had eight new players, they saw what their mates did on Thursday and those that didn't play today saw what they did.